Wait, you say. Arach-Knight? Who is this super hero? I don’t remember him from the comics! Where’s Spider-Man? Well, dear reader, Arach-Knight is in fact a Marvel character. Sort of. He is, in fact, Gabriel Stacy, the son of Norman Osborn and Gwen Stacy, whom in the comics became the Grey Goblin. But this, oh reader, is not Earth 616. 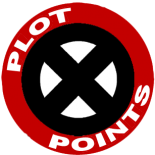 This is a variant reality developed for our Plot Point game by our bloggers, Earth 141616, which split from the mainline Marvel universe just before the events of Breakout. In this reality, when Gabriel learned the truth of his parentage and the lies ‘Uncle Norman’ had been feeding him and his twin sister Sarah (see the higly-controvertial Amazing Spider-Man #509-514, Sins Past) he did not choose the path of the Goblin as his Earth 616 variant did. Arach-Knight has two Power Sets to represent the two aspects of his abilities. His Taint Of The Goblin Power Set represents the enhanced abilities he has gained due to the Spider-Goblin formula and his own genetic lineage back to Norman Osborn. 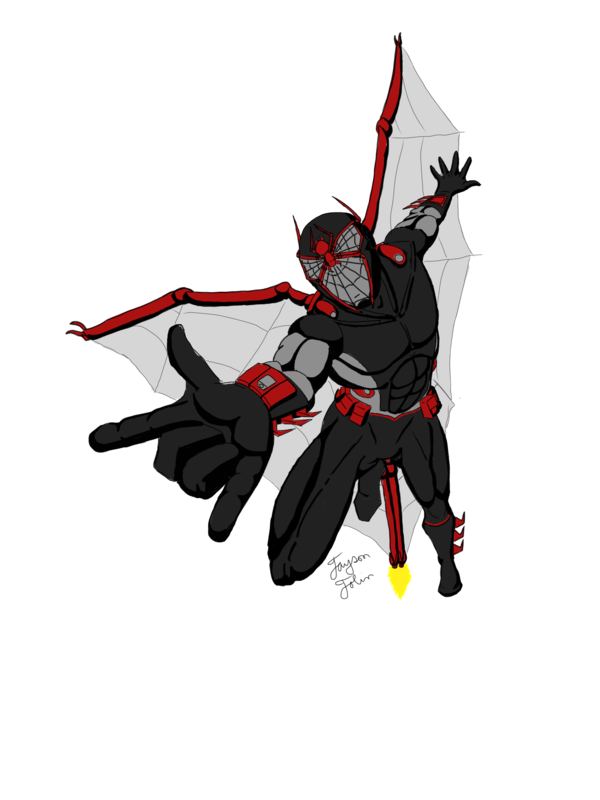 His Arachnid-Themed Gear Power Set represents both his armored suit (which gives him his durability, sensor suite, the ability to fly when his extra limbs are in wing mode, the shock gloves that are very little changed from the Green Goblin version, and his ability to cling to surfaces) and the gadgets he carries in his pouches, such as spider-rangs, gas grenades, smoke pellets, and anything else he might need in that adventure. The pouches replace the man-purse the Green Goblin carries. 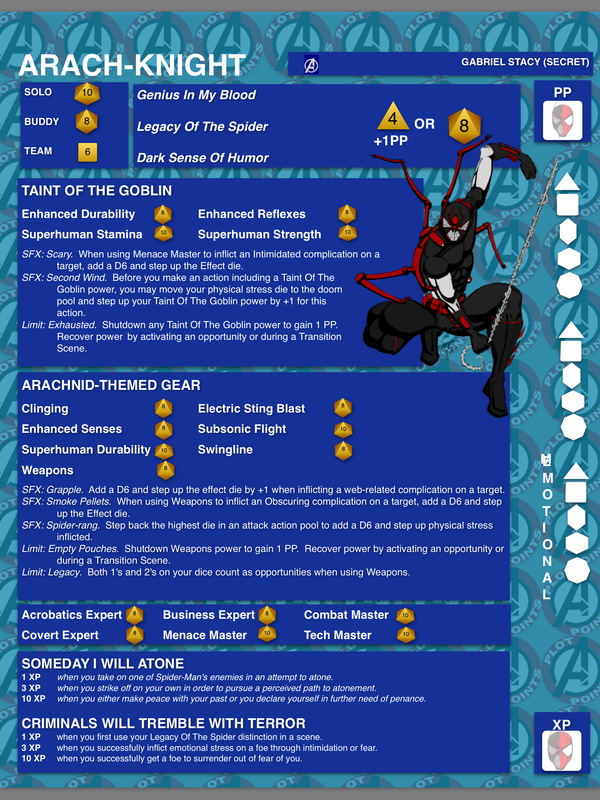 I didn’t want to split those two functions of Arachnid-Themed Gear into two distinct Power Sets, so Weapons represents most of the things in his pouches, and the Empty Pouches limit means that he either ran out of weapons to use or he doesn’t have the right item for the job. i wanted to thank you for your writing of a revised marvel rpg, the marvel nth edition. the new universal table is inspired. also look forward to reading more about arach-knight’s adventures. Thank you. The Nth Edition was a labor of love (and I have ideas for revisions to the character creation rules that, when I have a moment, I might actually finish). I hope you got some fun out of playing it. I’ve got another story for Arach-Knight in the works, but running the House Of Madness currently takes precedence. Thanks for your encouragement on both fronts. This entry was posted on September 29, 2015 by jpjolin in Actual Play, Datafiles and tagged Arach-Knight, Fearsome Avengers.